uninstalled and 270 lb/s flow. 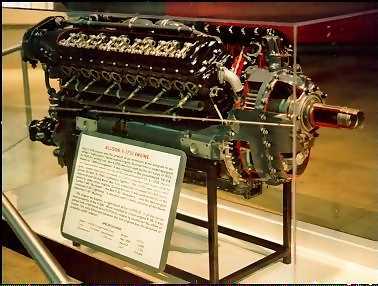 The V-1710 engine was the first product of an extensive Army program to develop a high-power, liquid-cooled engine. Derived from a model designed in 1930 for airship use, the V-1710 was first used by the Air Corps in 1932. Rated at 1,000 horsepower, it was installed in the Consolidated XA-11A, an experimental attack version of the Consolidated P-25. By 1938, the engine's output had been increased to 1,150 horsepower and was used to power the Bell X/YFM-1 multiplace fighters. The V-1710 was continually improved and during World War II its output was increased to 1,475 horsepower in some series engines. During the war it was used primarily in the Curtiss P-40 "Warhawk", the Bell P-39 "Airacobra", and the twin-engine Lockheed P-38 "Lightning". 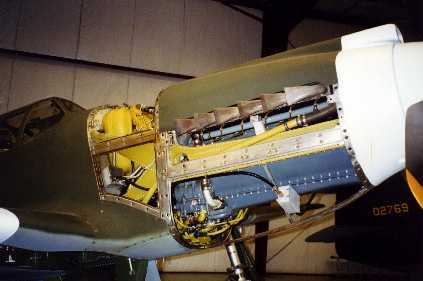 It was also used in early versions of the North American P-51 "Mustang". 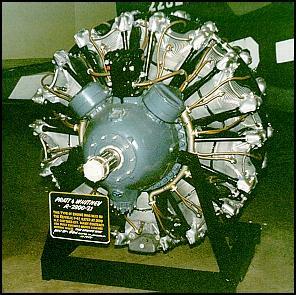 The engine on display, a right-hand drive V-1710-51, is of the series used primarily in the P-38G. When installed in a twin-engine P-38, it was paired with a left-hand drive V-1710-55 engine to counteract the effect of torque. The only difference between the two engines was the direction of propeller-shaft rotation. excellent arrangements on the Ranger inline air-cooled engines. 2000 hp was obtained from the R-2800 with 1 hp/1.4 cu in. (43.6 hp/L) of displacement. In 1939, when the R-2800 was introduced, no other aircooled engine came close to this figure, and even liquid-cooled ones barely matched it. The designing of conventional air-cooled radial engines had become so scientific and systematic by 1939 that the Double Wasp was introduced at a power rating that was not amenable to anything like the developmental power increases that had been common with earlier engines. It went to 2,100 hp in 1941 and to 2,400 late in the war, but that was all for production models. 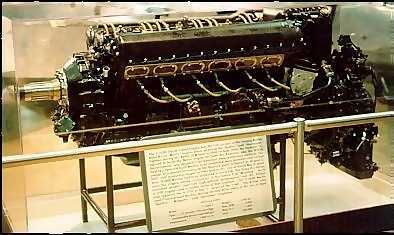 Experimental models, as always, were coaxed into giving more power, one fan-cooled subtype producing 2,800 hp, but in general the R-2800 was a rather fully developed powerplant right from the beginning. It was exclusively a powerplant for fighters and medium bombers during the war, being used in the P-47 , the F6F Hellcat, and the F4U Corsair , and also in the B-26 and A-26 twin engine mediums. Post-war its reliability commended its use for long-range patrol planes and for the DC-6, Constellation, Martin 404, and Convair transports. This last application is noteworthy, since these were twin-engine craft of size, passenger capacity, and high wing loading comparable with the DC-4 and the first Constellations. Two engines were all right for transports with the DC-3's moderate wing loading, and the high wing loading of the DC-4 was safe enough when there were four engines, but all that weight with only two engines seemed like tempting fate. However, the led from fatigue after a while.) The Convairs were just as good in their way as the four-engine transports. A well engineered installation and good controls were probably what made the difference; had the Convair encountered as many engine failures as did Curtiss-Wright's deplorable C-46 Commando, it would have been a sad story. long-established engines as the Cyclone and Twin Wasp were re-rated on fuel of much higher anti-knock value to give considerably more power. Perhaps the most outstanding example was the great R-2800 Double Wasp, which went into production in 1940 for the B-26 Marauder at 1,850 hp and by 1944 was in service in late model P-47 Thunderbolts (and other aircraft) at a rating of 2,800 (experimental) hp on 115-grade fuel with water injection. Of course, all engines naturally grow in power with development, but a major war demands the utmost performance from engines fitted to aircraft whose life in front-line service was unlikely to exceed 50 hours' flying, over a period of only a month or two. In peace time the call was for reliability over a period of perhaps a dozen years. And of course a pilot in combat has no time to fiddle endlessly with a fistful of engine controls in order to maintain the optimum engine operating conditions, and bearing in mind the rate at which aircrew had to be produced in wartime he probably did not have the knowledge of how to do this either.